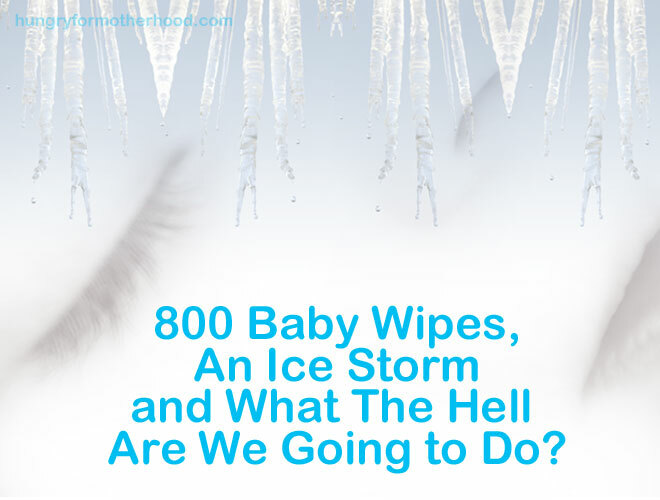 800 Baby Wipes, An Ice Storm and What The Hell Are We Going to Do? Yesterday an ice storm hit our area and knocked out the power for about eight hours. Not a big deal, just a first world problem. But for some reason, it got me all worked up. I’m sure it’s just the hormones talking, but I had this crazy “what the hell are we thinking?” moment. This feeling of “we can’t take care of ourselves, much less a baby” just really shook me. Or that could have been when the transformers blew up so loudly, so near our house that I screamed. I wanted to weep over a power outage. I felt robbed of control over my life, even though this is something routine that could happen to any household at any time. I know! It’s so silly. Just because a coating of ice compromised the way electricity is pumped to our house doesn’t mean I can’t handle being a mother. [BAM! Your double negative for the day!] What kind of weird correlation is that to bring up? Stupid hormones. So once I wiped my eyes, called out to work (because I didn’t want to try driving in the weather all weepy and hormonal) and took a little nap, we tried to take back control. My husband’s office closed due to the weather, so together we finally braved the roads and headed out for a hot lunch. Armed with gift cards from baby showers, we finally made some decisions about baby gear. I know it’s silly that debating the merits of a “travel system” versus just a stroller could make me feel better, but it did. And after hearing from some of my husband’s male co-workers who are also dads, he really wanted to go ahead and purchase a little stock pile of 800 baby wipes. Though it blows my mind that we will ever need 800 of anything for this kid, I’ve been assured by other parents that 800 might only get us to six weeks or so. It seems like the closer we get to the due date, the more nervous I am. I’m nervous about the physical ordeal of labor. I’m worried about taking so much time off work even though I’ve been assured by numerous mothers that I will be glad of the one-on-one time and won’t even want to go back to work once Gibson is here. I’m scared of being alone with our son for the first time with no back up parent when my husband goes back to work. But if this damn ice storm proved one thing to me, it’s that I’m not truly going to be doing this alone. My husband is very much on board. He even decided to buy a new winter coat for Gibson that will fit him next year. He’s thinking ahead and planning. I’m not by myself here. And we had no less than five friends offer their homes to us when I announced on Facebook that we were without power. We aren’t going to be high and dry. It’s not us against the world. We’re going to be okay. No matter how scary it is, we’re going to have support. And we’re going to be okay. HA! 8,000 sounds just so completely off the scales. I am kinda sad to think that the pregnancy is really coming to an end. Only five more weeks! Yeah ik what u mean. The end of my pregnancy was so bittersweet. It really could have lasted longer in my opinion. 😉 We had a few thousand wipes and at 4 months, we have almost used our stash. Oh yes… i miss them too. Even as i snuggle my little guy, i miss thar special time. But, not to worry. He’s been doing a lot of kicking,out here lately! He’s getting a little attitude lol.